(1) The honorable king said: 'My lord, I would like to hear oh master, what valorous deeds there are more of Lord Krishna, the Supreme Soul of Unlimited Powers. (2) How can anyone who is disgusted with running after material desires and knows the essence oh brahmin, desist from listening to the transcendental topics of the Lord Hailed in the Scriptures after repeatedly having heard them? (3) The actual power of speech is the one describing His qualities, the hands that really work are the ones that do His work, the true mind is the mind remembering Him as dwelling with the mobile and immobile living beings, and the ear that actually hears is the ear turned to His sanctifying topics [compare 2.3: 20-24]. (4) It is about the head that bows to both of His manifestations [among the mobile and immobile beings], about the eye that sees Him only and about the limbs that regularly honor the water that washed the feet of Vishnu or His devotees'." (12-13) The brahmin who thus repeatedly in various ways was entreated by his wife then thought: 'The sight of Uttamas'loka is indeed the highest attainment.' He took the decision to visit Him and asked her: 'If there is anything in the house that I can bring as a gift my good woman, please give it to me!' (14) She begged with the other brahmins for four fists of husked and parched rice, wrapped it in a piece of cloth and gave it to her husband to bring as a gift. Third revised edition, loaded November 18, 2014. The honorable king said: 'My lord, I would like to hear oh master, what valorous deeds there are more of Lord Krishna, the Supreme Soul of Unlimited Powers. How can anyone who is disgusted with running after material desires and knows the essence oh brahmin, desist from listening to the transcendental topics of the Lord Hailed in the Scriptures after repeatedly having heard them? The actual power of speech is the one describing His qualities, the hands that really work are the ones that do His work, the true mind is the mind remembering Him as dwelling with the mobile and immobile living beings, and the ear that actually hears is the ear turned to His sanctifying topics [compare 2.3: 20-24]. It is about the head that bows to both of His manifestations [among the mobile and immobile beings], about the eye that sees Him only and about the limbs that regularly honor the water that washed the feet of Vishnu or His devotees'." Sûta [1.2: 1] said: "After Vishnurâta [Parîkchit as being Vishnu-sent] had asked this question, he was addressed by the powerful sage, the son of Vyâsa whose heart was fully absorbed in Vâsudeva. S'rî S'uka said: 'There was a certain friend of Krishna [called Sudâmâ, not the same one as mentioned in 10.41: 43], a brahmin well versed in the Vedas, who, peaceful of mind and in control of his senses, was detached from the sense objects. As a householder he subsisted on that what came of its own accord. His wife was, just like him, poorly dressed and emaciated of hunger. 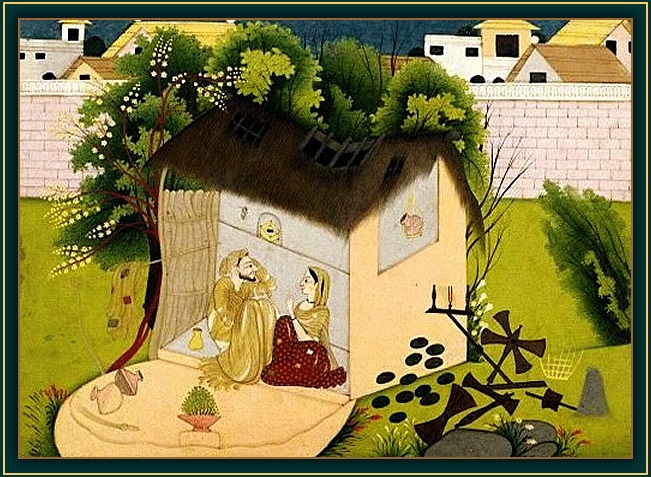 'Is it not so oh brahmin, oh master of devotion, that the Husband of S'rî is your friend and that that best one of the Sâtvatas is filled with compassion for the brahmins and is willing to give them shelter? Please approach Him, my most gracious man, for He, the Ultimate Shelter of the Saintly Souls, will then provide you with abundant wealth because you have such a hard time maintaining your family. She begged with the other brahmins for four fists of husked and parched rice, wrapped it in a piece of cloth and gave it to her husband to bring as a gift. Together with a couple of local brahmins the scholar passed three gates and guard stations and walked between the houses of Acyuta's faithful followers, the Andakas and Vrishnis. One normally could not go there and so he felt as if he had attained the bliss of the Pure Spirit. He next entered one of the opulent sixteen thousand residences of the Lord's queens [*]. Acyuta who sat on His consort's bed, saw him from a distance, immediately rose and came forward to close him gladly in His arms. The Lotus-eyed One in touch with the body of His dear friend, the wise brahmin, extremely ecstatic released affectionately some teardrops from His eyes. Having him seated on the bed He fetched some items to honor His friend and washed his feet. The Supreme Lord of All the Worlds took the water on His head, oh King. Then the Purifier anointed him with divinely fragrant sandalwood and aloe-wood [lignaloes or aguru] paste and kunkuma. He gladly honored His friend with aromatic incense and series of lamps and offered him bethel nut and a cow. Next He spoke a word of welcome. The goddess [Rukminî] was personally of service by carefully fanning with a yak's tail the dirty and poorly dressed, emaciated twice-born soul, whose veins could be seen. Taking hold of each other's hands, oh King, they discussed the charming topics of the past when they together lived in the school of their spiritual master [see 10.45: 31-32]. The Supreme Lord said: 'Oh brahmin, after the guru received his remuneration from you and you returned [home] oh knower of the dharma, did you marry a suitable wife or not? With your mind occupied by household affairs, you were not driven by desires and I also know that you do not take much pleasure, oh wise soul, in the pursuit of material happiness. Some people perform their worldly duties without being disturbed by desires in their minds. Acting to set an example as I do, they shake off the propensities that naturally arise. Do you, oh brahmin, still remember our stay in the gurukula? It is there that a twice-born soul learns to understand what needs to be known and thus manages to transcend his ignorance. One is born twice my dear friend: after first being born materially one [secondly] manifests through a spiritual master, a bestower of spiritual knowledge like Myself, who teaches what the duties are for all spiritual orders [or stages of life, see âs'rama and 7.12]. Among those engaged in the varnâs'rama system [see also B.G. 4: 13] in this world, they [who thus are twice born] are the expert knowers of the true welfare, oh brahmin, for they cross over the ocean of material existence with the help of the words stemming from Me in the form of the spiritual master. I, the Soul of All Beings, am not as satisfied by ritual worship, a new life, austerity or self-control as I am by faithful service to the spiritual master [compare 7.14: 17]. Oh brahmin, do you still remember what we did, when we were living with our spiritual master, when we once by the wife of our guru were sent away to fetch firewood? Having entered a big forest, oh brahmin, all out of season, a fierce harsh thundering wind arose with rain. With the sun having set we, with all directions covered in darkness and with all the water around us, could neither recognize the direction nor high or low areas. Constantly heavily besieged by the fierce wind and water in that flood, we did not know what way to go and in distress wandered through the forest holding each other's hands. Our guru Sândîpani knew this and at sunrise set out to search for us, his disciples. The âcârya then found us suffering. 'Oh you children, for my sake you have to suffer heavily! In your devotion for me you have disregarded that what is most dear to all living beings: the [comfort of your] body! Well, this is what disciples should do to pay the debt to their spiritual master: being perfectly pure in their love, they must be willing to offer the spiritual master their very self and possessions. The brahmin said: 'What more is there for me to achieve in life, oh God of Gods, oh Guru of the Universe, than to have lived together at the guru's house with You whose every desire is fulfilled? *: S'rîla Vis'vanâtha Cakravartî quotes from the Padma Purâna, Uttara-khanda, which says that the brahmin actually entered the palace of Rukminî: 'sa tu rukminy-antah-pura- dvâri kshanam tûshnîm sthitah'; 'He stood for a moment in silence at the doorway of Queen Rukminî's palace'. 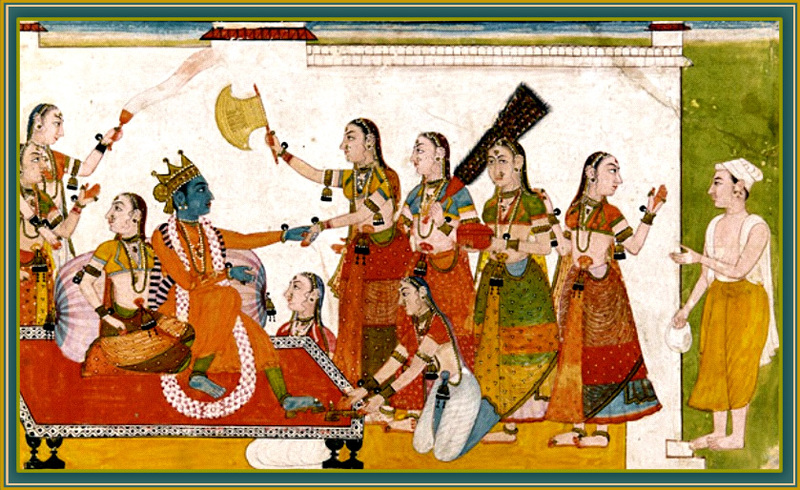 The first painting is titled: 'Sudama's wife urges him to seek Krishna's help', ca. 1775 - ca. 1790, © Victoria & Albert Museum. @Public domain, Source: Smithsonian Freer Sackler Gallery".